The dual pressures of continuing needs for emergency surgery and a growing need for post-operative care are all-consuming work for many Médecins Sans Frontières (MSF) teams in Haiti. In Port-au-Prince, Choscal hospital in the Cite Soleil district is still operating around the clock on an average of 20 to 25 people each day. In Martissant, where the theatre has been working since shortly after the earthquake in Port au Prince, there are 20 people with open fractures in their waiting room. In the town of Leogane, where MSF has recently started doing surgery in the local hospital, 30 patients have already been operated on and there are now 40 patients on a waiting list. Psychologist Marie Lafortune assesses patients in Martissant for psychological needs Jan 2010. Because most who have been operated will need some form of continued care, the pressure for beds and nursing resources is substantial. MSF has just identified a new building, a former nursery in central Port-au-Prince, that can be used to help accommodate these people, while another structure in the city at Bicentenaire is open for work with post-operative cases. A replacement for the old and damaged hospital at Carrefour has been found next door in a school building and patients have already been moved in. The major change today in MSF's resources has been the full opening of the inflatable hospital in a field in Port-au-Prince. MSF teams have started performing surgeries and have space for around 180 patients in the tented wards. Terrible memories of what happened to solid buildings during the earthquake have made many patients fearful of staying inside a normal hospital. The soft, flexible walls of the new field hospital make a big difference. "Patients feel less anxious here," said Veronica Chesa, a nurse at what is now called the Saint-Louis hospital. “They have less difficulty getting to sleep and I noticed a decrease in the sedative drug requests.” The psychological impact of the quake presents a huge challenge for everyone who was there and MSF has been building up its specialist staff. There are currently 18 psychiatrists and psychologists providing support to both patients and medical staff who worked through the disaster. 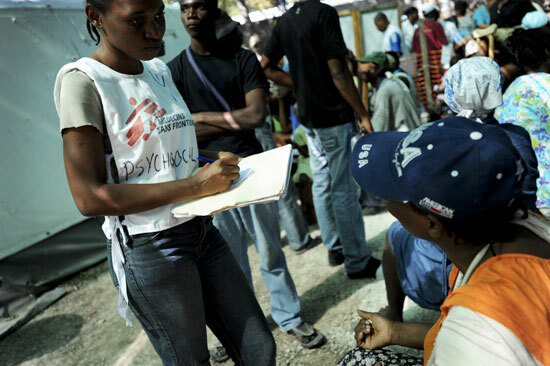 “The first step is to provide basic psychological information, to explain that they’re not mad even if they are stressed,” says Dr.German Casas, an MSF psychiatrist. His fundamental message is that “It's normal to feel anxious, it's normal to be scared. It¹s useful to be scared, it protects you.” Outside of the city, in the town of Grand Goave, the early stages of distribution of households essentials like soap, buckets and blankets is well under way. Over 1,300 families received these essential in the past two days, while in Jacmel, the same number should be achieved by the end of today. Leogane is the next target with some 1,200 kits to be distributed there.